Are stocks’ glory days behind us? What about bonds? 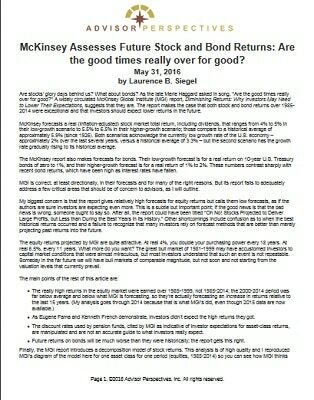 As the late Merle Haggard asked in song, “Are the good times really over for good?” A widely circulated McKinsey Global Institute (MGI) report, Diminishing Returns: Why Investors May Need to Lower Their Expectations, suggests that they are. The report makes the case that both stock and bond returns over 1985-2014 were exceptional and that investors should expect lower returns in the future. McKinsey forecasts a real (inflation-adjusted) stock market total return, including dividends, that ranges from 4% to 5% in their low-growth scenario to 5.5% to 6.5% in their higher-growth scenario; those compare to a historical average of approximately 5.9% (since 1926). Both scenarios acknowledge the currently low growth rate of the U.S. economy – approximately 2% over the last several years, versus a historical average of 3.3% – but the second scenario has the growth rate gradually rising to its historical average.